I loved this movie when I saw it, I wish it was still streaming on Netflix so I could watch it again. There are a handful of movies I put in a "surprise tonal shift" category. Where I went into them somewhat blind as to where the movie was going, ones where the genre shifts partway through, and/or where I get surprised in a happy way by the emotion of the ending. 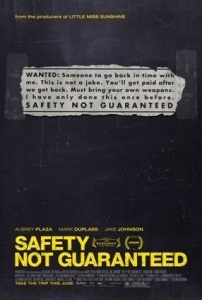 "Safety Not Guaranteed" was one of those for me. I'd heard good things about the movie, but not a lot of details, so, I went into it not knowing whether I was watching a movie about a time traveler or a movie about a delusional person, so, getting to the end was such a delight. I saw this pretty much cold, and really enjoyed it. It reminded me of Happy Accidents. Coming to the film with no information except having read about the real ad, I found it delightful. The absurd-but-not-hammy tone of the film is hard to get right, and they pulled it off beautifully. My one gripe about the movie is the age difference between Mark Duplass and Kristen Bell -- in 2012 he was 36 and she was 32, and they were supposed to have been school-age contemporaries. Wow. That's a very fine-tuned ability to distinguish ages. I'm a lot farther along the face-blindness continuum than most, and anyone between 14 and 70 looks more or less the same to me, but it never would have occurred to me they weren't old school pals. I looked up their ages on IMDb, if that wasn’t obvious. I just remember being thrown by Kristen Bell’s appearance on first watching the movie because of how much younger she looked than Duplass (which, I’m sure was partly influenced by me knowing her from Veronica Mars where she was an adult playing a teen), but then later hearing/reading some interview with an actress talking about how discouraging it was to have lost out on the Aubrey Plaza role for being too old despite being the same age as Duplass. The fact that both actresses were younger than the male lead just stuck out to me - not as bad as pairing 60-70 year old actors with 20-somethings, certainly, but still. I thought this was fun/interesting. I hear they shot both endings (the machine works, it doesn't) and made the switch at the last minute.